If you like food, the first thing you hear about when moving to or visiting Cleveland is Tremont. Tremont is a Cleveland neighborhood west of the Cuyahoga River and is listed on the National Register of Historic Places as it is one of the oldest parts of the city and contains multiple notable historic churches. Tremont was also the site of the short-lived Cleveland University, which explains the streets named “Professor,” “Library”, and “College.” Tremont had a thriving immigrant and working class population in the early 20th century until the recession in the early 1980s. Also of note from the 1980’s was the filming of “A Christmas Story” featuring a house in Tremont (tours available, of course). Since the 1990s, Tremont has slowly experienced a renaissance and is now known as a destination for hip housing, food, and art. One such hip food destination in Tremont is Ginko, located beneath another hip restaurant named Dante. Ginko is a small sushi restaurant and bar. And, when I say small, it’s pretty small. If you want a table, you need to make reservations. Also, the tables are small, so don’t expect Ginko to be able to seat a large party. For those of us who wait until early Friday night to inquire about a seat, there’s the “river flowing water sushi bar” which seats on a first-come basis. It was on such a late summer Friday night that Steve and I decided we had to have sushi. At Ginko. So, we called only to find all the tables had been booked. The hostess did tell us, though, that at 8:30pm (yeah, we had a late lunch) there were seats at the bar. So, off we dashed to Ginko to check this place out. Ginko did not disappoint. 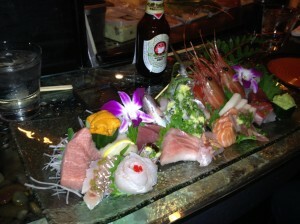 The server behind the sushi bar was a Japanese and sushi aficionado and proud of it. According to the server, the fish served at Ginko are bought from the Tsukiji fish market in Tokyo, Japan and flown to Cleveland. 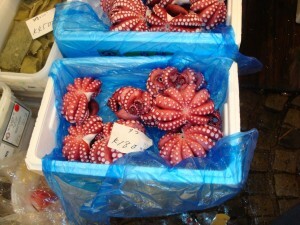 We were familiar with this fish market from our Tokyo visit back in 2009 (Figures 1 and 2). Steve is pretty adventurous and loves sashimi, so the server suggested the six course chef’s tasting menu (Figure 3). The cuts were tasty and obviously of high quality (which we anticipated given the prices--this is not your conveyor belt sushi kind of place!). Everything about the tasting menu was delicious. And, everything apparently was edible. 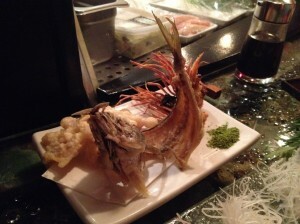 I can’t say that I ate the entire fish skeleton (Figure 4), but I did enjoy a munch or two. And, as expected, Ginko serves an assortment of Japanese beer as well as some very nice wines (by the glass, too!). I am sure they have great cocktails, but we went straight for the dinner fare and didn’t try their mixology offerings. Overall, we had a great sushi experience at Ginko, and we can only hope to find two empty seats at the bar waiting for us sometime soon again. Figure 1. 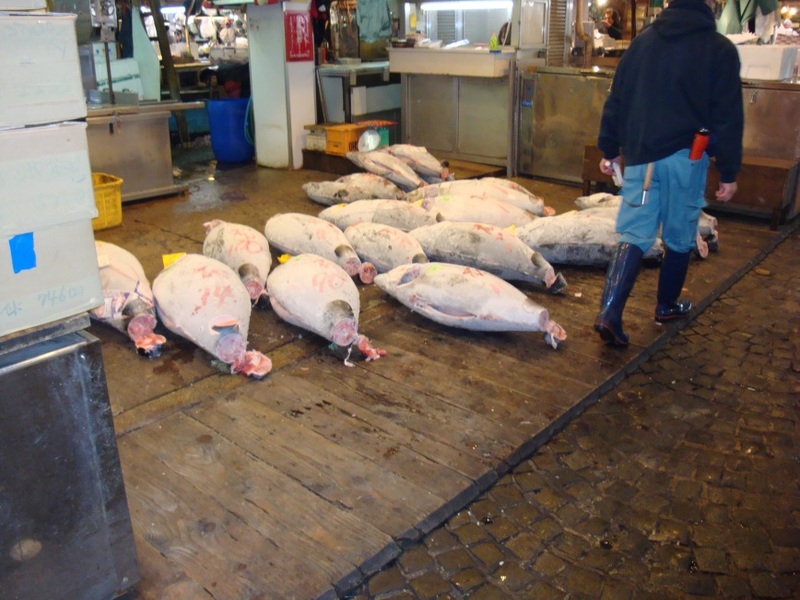 Tuna for sale at the Tsukiji fish market in Tokyo, Japan (2009). Would you believe we had to get up around 5am to see this place? Figure 2. Octopus for sale at the Tsukiji fish market in Tokyo, Japan (2009). Figure 3. Dante’s chef’s tasting menu. A nice selection of very fresh and tasty sashimi. Figure 4. Everything’s edible on the tasting menu! Posted in Cleveland Calculus and tagged Tremont.